When the church was first built, the interior would have had a different ambience from today - many of the walls were sumptuously painted and yet the windows were plain glass. The stained glass has been added over the years and the stories behind the stained glass designs are somewhat mysterious. Perhaps the biggest of these mysteries surrounds the window on the south wall, next to the Martyrs' Chapel. This portrays Saint Louis, who was king of France in the 13th century and St Barbara and is it dedicated to a French nobleman and his wife. But why commemorate French nobility here in Gloucestershire? Well, the basic facts are there in the words on the window- “Pray for the Soul of Gabriel Jean Marie de Lys Marquis of France who died August 24th 1831 aged 47 years and of Barbara Maria his wife who died September 10th 1857 aged 66 years”. When I started to research the Marquis, it soon appeared that he fled to England from Brittany as a child, accompanied by his father, to escape the terrors of the French Revolution which had already claimed the lives of many of their aristocratic family. The earliest documentary evidence I have found is his graduation as a doctor in 1808 at Glasgow University. He established his medical career in Birmingham, practising at the Birmingham General Hospital, where he quickly became highly regarded. In 1812 he delivered an influential lecture to the Birmingham Philosophical Society which led to the foundation of the institution that was to become the Royal School for Deaf Children. In 1823, he married Barbara Maria Ledsam, from a local Birmingham Catholic family. In spite of his eminent position, it appears that he did not lose his Gallic temperament nor his aristocratic sense of honour. He was a member of a medical subscription library which was being wound up, and he was delegated to remonstrate with another Birmingham doctor, one Edward Townsend Cox, who was refusing to return his library books. Such was the hostility of his reception by Cox, it became a matter of honour and a duel was arranged. Dr Cox had no duelling pistols of his own and borrowed a pair from a gunsmith in New Street. On the appointed day, Dr de Lys affectionately kissed his wife and children, without informing them of his deadly purpose, and set off with his pistols accompanied by his second. Fortunately, word had got out and at the appointed place they found themselves confronted by the local constable who ordered them to desist. On receiving back the pistols, the gunsmith returned them promptly to the shop window with the label “Birmingham Duelling Pistols Out twelve times, but as yet unfired”. Overdue library books were obviously a very serious matter in those times! By 1831, the Marquis was dead, at the young age of 47 and leaving a young family. There seems to be no connection with Woodchester at that stage, but there is a memorial to him in Birmingham. Gabriel's son Francis Gabriel de Lys, the new Marquis, went on to study at Oscott College in Birmingham where the spiritual director was Nicholas Wiseman – later to become Cardinal Wiseman – recently returned from being rector of the English College in Rome. The priest at Oscott was one George Spencer who had studied under Wiseman in Rome and was later, as Ignatius Spencer, to become head of the Passionist order in England. Both Spencer and Wiseman were present when our church was consecrated in 1849. So, a possible loose connection to Woodchester here! Maybe the spiritual mentors of the young Marquis had exerted a lasting influence on him and his family? This fine stained glass window on the south side of the church proclaims that it is dedicated to William and Clementina Mostyn. But who were they? And why was a scene of a saintly young woman serenely facing her executioner chosen to commemorate them? We turn first to the saintly young woman. Most Saints are shown with their symbols or “attributes” - keys to gates of Heaven for Saint Peter, a dragon for Saint George and so on. Here the main clue is a royal coat of arms that appears to be that of George Plantagenet, 1st Duke of Clarence, the brother of both Edward IV and Richard III – the Clarence who, according to Shakespeare, was drowned in a barrel of Malmsey wine. The story now falls rapidly into place. The executioner's victim was born Margaret Plantagenet, the daughter of the said Duke of Clarence. She married Sir Richard Pole and became Margaret Pole, Countess of Salisbury. She is now referred to as Blessed Margaret Pole, having been beatified in the 19th Century. Margaret was initially very close to King Henry VIII, indeed she was governess to his daughter, the future Queen Mary. However, being at court was a dangerous business at that time, especially for Margaret who remained a Roman Catholic. Furthermore, one of her sons was a Cardinal who was implicated in a plot against the king. Because of Margaret's faith, not to mention her family's rival claim to the monarchy, it is not surprising that Henry chose to accuse her of treason. She was duly imprisoned in the Tower of London and eventually executed. The fact that Margaret was not a young woman but a frail 67 year old at the time did not spare her the axe. As Margaret was of royal blood, the execution was not a public one. Various accounts of the execution have nevertheless emerged over the years, and all are probably influenced by political spin, but it seems clear that she protested her innocence to the last and that the execution was botched, several blows of the axe being required to complete the job. Now to the Mostyns. William Mostyn was from an aristocratic Welsh Catholic family – he was the son of Sir Edward, 7th Baronet Mostyn. He and his wife Clementina lived locally in Woodchester in the early years of the 20th Century, William dying in 1909 and Clementina in 1925. The Mostyn family had a connection to Margaret Pole and was clearly proud of it. William's nephew, Francis, the Catholic Archbishop of Cardiff claimed a direct descent from Margaret Pole via his mother (William's sister-in-law). But the connection is even stronger. Clementina Mostyn was the great-granddaughter of Sir William the 6th Baronet Jerningham, and Sir William's mother was Mary Plowden, the 6-times-great-granddaughter of Margaret Pole! Sometimes, the reason why someone is buried in our churchyard or commemorated in stained glass is a bit of a mystery. Herman Joseph Lescher, for example, who is commemorated in one of the windows on the north side of the church does not seem to have a local connection. Although he came from a prominent Catholic family, he was firmly based in London and the Home Counties. His family origins go back to a small village in the French region of Alsace called Kertzfeld where the name was spelt 'Löscher'. Herman's grandfather settled in England along with one of his brothers in the late 1700s. It was a strange time for migration as Alsace was in a period of peace and prosperity whilst Britain and France were periodically at war with each other. However, the move was clearly a success - they both married English women and both families quickly became part of the establishment. Herman was born in 1849 and by the time he died in 1897, the family had been recognized with an entry in Burke's Family Records and a coat of arms. Herman first tried his hand at farming but then became an accountant. He was a bit of a polymath, being a a fellow of not only the Institute of Chartered Accountants but also the Statistical Society and the Chemical Society. He was also a Freeman of the City of London. He lived in Hampstead and his business was in London. And his Requiem Mass was in London too. So why is he buried here with a stained-glass window dedicated to his memory? Well, the clue is in his funeral report in The Tablet which mentions that the mourners included Father Wilfrid Lescher OP. Wilfrid was Herman's older brother and, as the 'OP' indicates, was a Dominican. Indeed, at the time of Herman's death, Wilfrid had recently been the priest at Stroud and earlier had actually been Prior of Woodchester. Wilfrid's connection to Woodchester went back to 1864 when he had joined the order. Unusually, he did not take a new name when he became a Dominican. He was a preacher and writer and, as his obituary tells us, he was a 'strenuous fighter, especially for the Anti-Vivisection Society ... and in Catholic controversial literature. But of late years he has been especially prominent in the discussed authenticity of St. Dominic's founding of the Rosary'. He died in St Peter's Priory, Hinckley in 1916 and, perhaps surprisingly, is not buried at Woodchester, like his brother, but at Mount St Bernard, Charnwood Forest. So, we can make a reasonable guess as to why Herman came to be buried here. 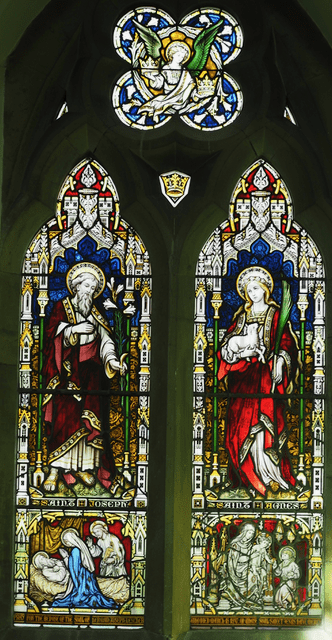 No guesswork is needed however to explain the choice of saints portrayed in the window: Joseph and Agnes are the middle names of Herman and his wife. 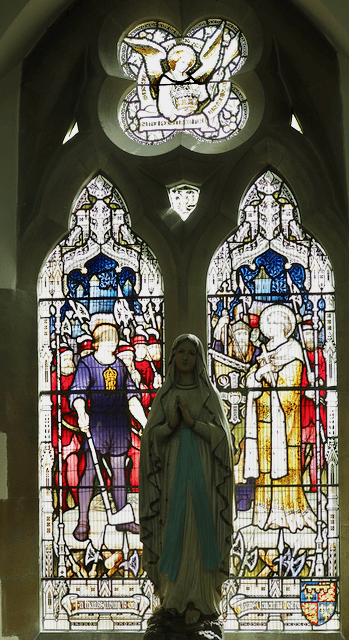 The stained glass windows in the Martyrs' Chapel are some of the oldest in the church. It seems likely that they were plain glass windows when the church was consecrated as contemporary accounts of the new church do not mention them saying - The interior is very magnificent. The west window is filled with richly-stained glass, as also the east window, while the others being filled with a deep green tinted glass, diffused a sombre light throughout the whole edifice. However their similarity in style to the richly-stained windows in the account suggests that they were added soon after the church was built. They are also similar in style to the De Lys window. Some of the original green-tinted glass can still be seen today. Like all of the features of the Martyrs' Chapel, the windows are very personnel to William Leigh and his family. The window at the east end of the chapel depicts saints who were described in the older guide books as the “patron saints” of Mr Leigh's children - William, Caroline Blanche and Beatrice Catherine. I have always assumed that these would be the saints whose names they took when they were confirmed, but there may be some other explanation. So, in the window, from left to right, we have St Teresa of Avila, St Aloysius and St Agnes. 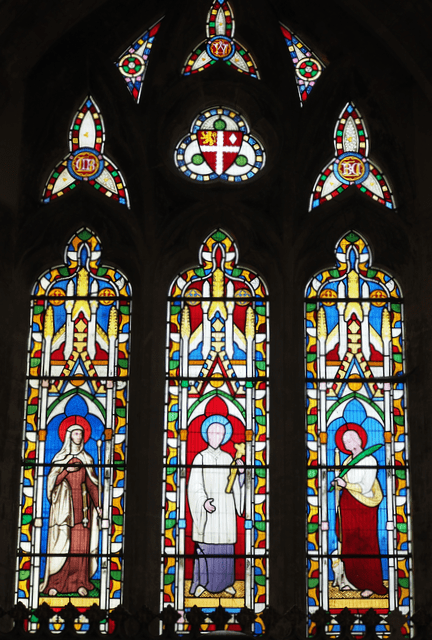 The south window of the chapel has the patron saints of William Leigh and his wife Caroline, St Augustine of Canterbury and St Monica. St Monica was the patron saint of wives and, coincidentally, the mother of another St Augustine, St Augustine of Hippo.